Weiland produces custom sliding doors and windows for high-end architectural projects. 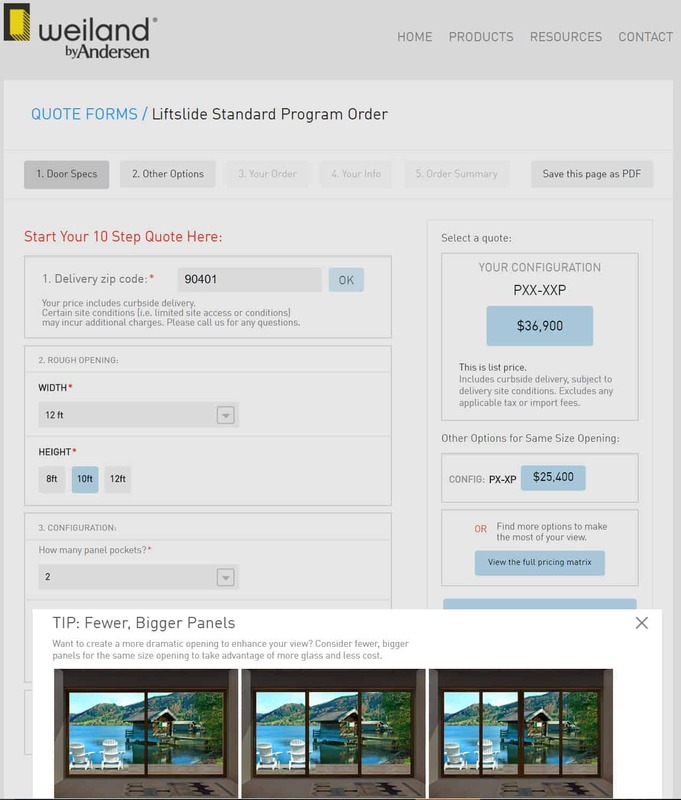 The company was looking to create a way for customers to build quotes online, and approached Nextware about building the system. As in all complex product configurators, it was key to simplify the user interface and to eliminate the possibility of user selecting an incorrect permutation of size, style and optional features. Nextware’s engineers worked closely with the team at Weiland to accurately capture a product catalogue with all permutations in size and style. Nextware also built Weiland’s customer quote system without disrupting the flow of its existing marketing and outreach – a key factor in ensuring the project’s success. The user interface was designed to match the refined aesthetic of Weiland’s website. The quote system was seamlessly integrated with Weiland’s email outreach, providing customers and partners with all the relevant documentation and engineering drawings for each order. Once Nextware’s online quote system went live, it became clear to Weiland that the project’s scope should be widened to include pricing, order entry, and an order management system. When the expanded project was complete, Weiland enjoyed a fully integrated system, built around its customers and their needs.